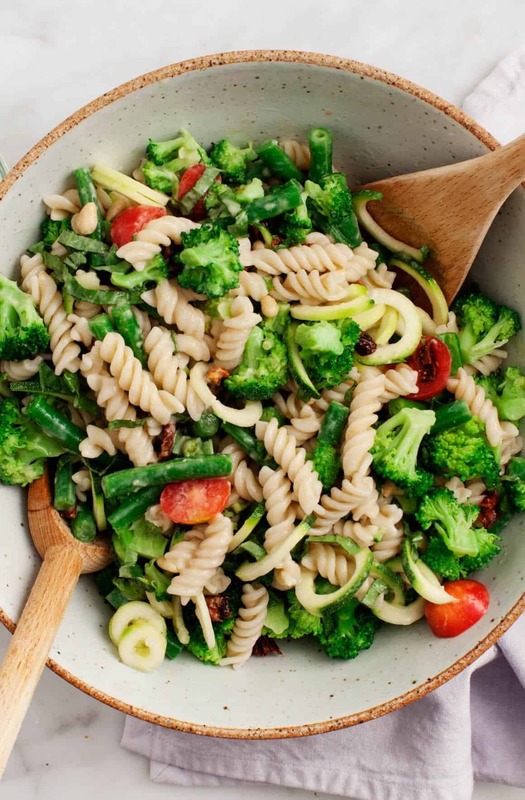 This bright broccoli pasta salad recipe is chock full of fresh veggies and coated with a tangy no-mayo tahini dressing. Perfect for summer picnics! This is not your regular pasta salad. In fact, Jack (who is not the biggest fan of traditional pasta salad) said “Omg, this is the best pasta salad!” It’s healthy and packed with lots of veggies, and unlike a lot of pasta salads, it’s light on the mayonnaise – in that it has none. With Memorial Day coming up, I figure you may need a packable potluck salad that won’t spoil if it sits out for a little while. This one, made with a creamy tahini dressing, is just right for that. How to Make Pasta Salad – the Healthy Way! Bring on the veggies! 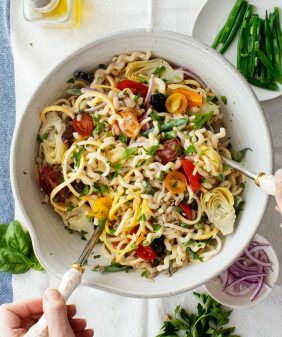 This pasta salad has a high ratio of veggies to pasta, thanks to the spiralized (or thinly sliced) zucchini. With a pasta-like feel, the zucchini lowers the amount of noodles needed to make this salad satisfying. Plus, blanched broccoli and crunchy green beans add lots of texture, while sun-dried tomatoes and basil add pops of fresh and savory flavor. Make a punchy dressing. Instead of a mayo-based dressing, which is traditional for pasta salad, I made a creamy tahini dressing with lemon, olive oil, garlic, and a touch of Dijon. As a result, this dressing is vegan, but it still has a bright, tangy flavor. Make it dietary restriction-friendly. I find that everyone has some sort of dietary restriction these days (raising my hand just a little), so I used gluten-free fusilli. Consequently, this salad is entirely vegan and gluten free. I think it’s nice to bring a delicious dish that everyone can enjoy to gatherings. Of course, you can use regular pasta if this isn’t a concern for you. Make a big batch! This salad keeps well for several days, so if you make extra ahead of time, you’ll be set with healthy lunches for a week. Blanched broccoli and green beans – They pack this salad with green and add crispy, crunchy texture. Noodles – Because you can’t have pasta salad without pasta, I chose a fun fusilli. 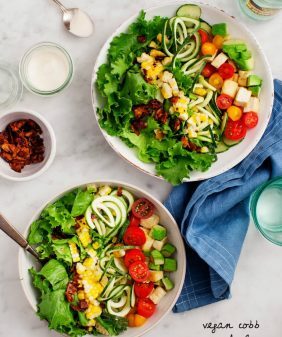 Spiralized zucchini – Since I was going for a high veggie to pasta ratio, spiralized zucchini was an obvious choice to add more “noodles” to this salad! Cherry tomatoes and sun-dried tomatoes – They have fresh, tangy, umami flavor, and I love their bright red color! Basil – Who doesn’t love basil in the summertime? It adds a nice fresh flavor here. Pine nuts – For crunch! 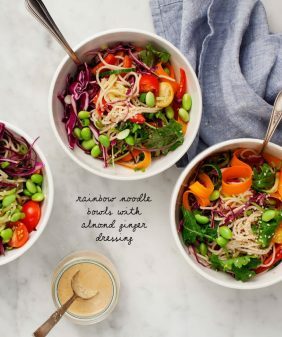 A creamy tahini dressing – This bright, tangy vegan pasta salad dressing ties it all together. I love all of the pretty, colorful veggies! This healthy broccoli pasta salad is made with a tangy, vegan no-mayo tahini dressing - perfect for summer picnics! Prepare a large pot of salted boiling water and a large bowl of ice water. Drop the broccoli and green beans into the boiling water and blanch for 1-2 minutes, until tender but still bright green. Remove and immediately immerse in the ice water to stop the cooking processing. Keep in the ice water long enough to cool completely, about 15 seconds. Then, drain and and place on a kitchen towel to dry. In a large pot of salted boiling water, prepare the pasta according to the instructions on the package, cooking until al dente. Drain and rinse with cold water. In a large bowl, combine the broccoli, green beans, zucchini, tomatoes, basil and the pasta. Drizzle with the dressing and toss. Season to taste with salt, pepper, and squeezes of lemon, if desired. Sprinkle with the pine nuts and chill for 15 minutes. Can be stored in the refrigerator for up to 2 days. I used Delallo's Gluten-Free Fusilli which is awesome. In my opinion, sun-dried tomatoes are the work of the devil. Is there a replacement ingredient that you would suggest? Or will the salad still be delicious if I simply omit them without a replacement? Thank! ha, you can just skip them. I thought I was the only one who felt that way about sundries tomatoes. Glad I’m not along!!! You are not alone! I’m one of the least picky eaters (growing up in a Russian household will do that to a girl), but this is one of three foods I won’t touch… preach, girls. 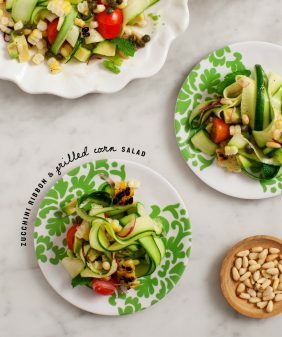 Can’t wait to try this recipe (sans evil sundried tomatoes) as a nice cold summer dinner! Wow – all kinds of deliciousness going on in this pasta salad! And so beautiful. Who could resist this?? That lemon dressing sounds delicious! I just made this and the dressing is SOOOO good that I want to bathe in it. I used GF fusilli, but didn’t have all of the same veggies, so I subbed asparagus for zucchini, snap peas for green beans and lemon thyme for basil. I actually love a good quality, moist sundried tomato, but was out so I skipped those, too. You could throw an old shoe in the mix with this dressing and it would still be a winner. THANKS!! This has me so inspired to start using tahini more! What a perfect picnic salad. I like things to be lemony too. Also love the extra tartness and chewiness the sun-dried tomatoes give in this. 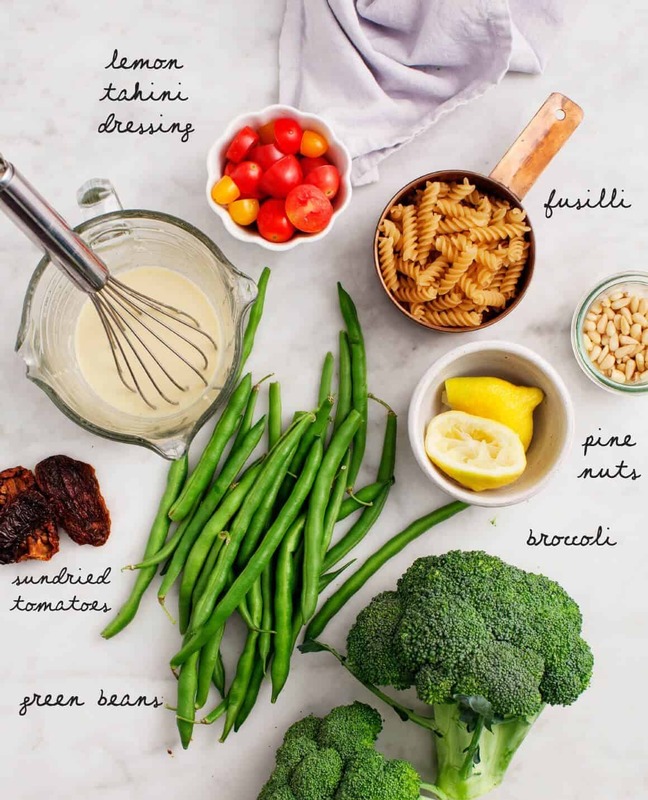 I had no idea I was craving pasta salad until I saw this….looks AMAZING! I’ve been making mine similarly for years, lots of veggies, dijon and olive oil dressing, but never found a creamy sub for mayo (can’t stand the stuff). I can’t wait to try this! This salad is delicious!! The dressing is light and flavorful. Paired it with grilled chicken for a wonderful dinner. Paired it with a Giada recipe for grilled chicken with basil dressing and did the marinade but not the dressing and it is phenomenal. Thanks. Thanks for the recipe! It was a hit with my family, including 1 and 4 yr olds! We’re adding this to our list of adaptable recipes for csa season. Do you need to cook the zucchini? This has inspired me to do a pasta salad. I’m going to change it up a bit though. I’m going to roast the broccoli instead of steaming/boiling (add another layer of flavour), I’m going to steam the green beans (because I don’t like raw green beans), I’m going to add some thinly sliced red onion, sub the zucchini for cucumber (again, don’t love raw zucchini), add some sliced radish for crunch, sub the sun dried tomatoes for some homemade roasted red peppers I have in the freezer and sub the maple syrup for honey (because I’m fresh out of maple syrup). I’m also going with regular pasta because I’m not gluten free! I think this will be a great riff on your recipe! Hello, thank you so much for this recipe. I am eating it for lunch right now and it tastes amazing! I made this recipe for my meal prep this week. I subbed spaghetti squash for the pasta and added chicken. It was divine. I love this blog! All the recipes are so fresh and healthy. Thank you for all the ideas! Sounds like a great recipe, especially with the dressing 🙂 Green beans are, however, poisonous if not cooked long enough- 10-15 minutes are usually recommended and it can be especially dangerous for children to eat undercooked beans. Please be careful should you bring the salad to a party! I don’t believe green beans are poisonous uncooked. I’ve never heard that. I’ve been eating them out of the garden since I was a child. Has anyone else heard this? I made this last night. There are no words to describe how delicioous this salad is. It was so good that at one point, I put down the fork and started eating directly from the salad bowl…with my FINGERS! Can anyone reccomend a substitution for the tahini? I want to share this with a friends whose child has nut and sesame allergies as the rest of the would be perfect for them. It looks delicious! Delicious recipe! I skipped the zucchini because I’m not crazy about the stuff. I will definitely make again but I think I will use all sun-dried tomatoes instead of the fresh tomatoes, which didn’t taste so great the next day. I made this for meal prep for my husband and I. He’s never been a huge fan of pasta salads and he loved it! Great recipe! Not a fan of pasta but gotta try this..looks yummy! This was amazing! My husband absolutely loved it as well. The dressing was so creamy, it made the whole dish seem decadent. Loved blanching the veggies too, gave them such a nice texture. We will definitely be making this again…. 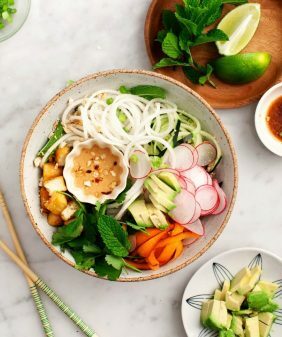 Green is the main color in every repice, i love it, that lemon dressing sounds delicious! I am a vegetable lover, especially fresh ones in pasta dishes. This is wonderful. this is literally one of the most delicious things I have made! thank you for the stellar recipe!! You’re welcome, I’m glad you loved it!! Thanks for commenting! If only pasta were low in carbs. I’m going to have to try these with spaghetti squash. Which brand of Tahini do you use? The salad looks very yummy. I’ve made this twice for potlucks and both times was asked for the recipe. Both times I’ve added edamame. I love the lemon tahini sauce – easy to make and delicious. I’ve used this sauce in salads and veggie bowls – delicious! So happy to hear this one was a hit as well! hope you take a look. Deelish! Used only half the garlic and regular pasta, definitely going into the easy weekday rotation for the family and definitely using the dressing in different applications, so creamy and zingy! Thank you for the delicious recipe! I made this because my boyfriend bought a large jar of tahini (despite me not being a super fan of the stuff) and we needed something to make with it. This recipe was perfect! The sauce is very tasty and is the perfect amount for the veggies and pasta: not dry and not drenched. Hi Courtney, I’m so glad you both loved it!! 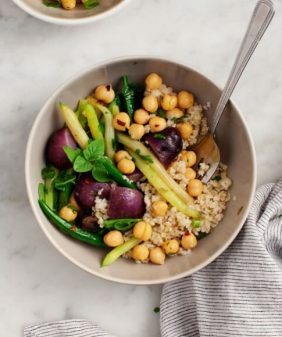 If i were to make this as a main meal, how would you recommend increasing the ingredients? I think it’d make an excellent mason jar meal for lunches for the week! Hi Joan, I wouldn’t change anything – depending on your lunch appetite, I’d say this would make 3 to 4 prepped lunches. I hope you love it! I made this this week for my husband’s lunches, and he loved it! Unfortunately, it was not until the fourth day that we realized tahini is not necessarily gluten free. Unless it is certified gluten-free, the sesame seeds are often roasted with flour. So, just a warning to others who might not know that, double check that your tahini is certified gluten-free! we made some alterations as well: we’re not big tomato fans, so left out the tomatoes. We added dried cranberries and some shredded chicken, and replaced the green beans with cauliflower. Hi Laura, thanks for the tip. I’m glad your husband loved the recipe! It took several hours to put together this dish and was too bland for my tastes. I tried to save it with a bit more tahini and Dijon, but still bland. My husband said it was good enough to have again, but it’s too much work for the outcome. Please keep up making more recipes. I love your site, just not this one. Love it, your recipes are AWESOME!!! !